The Scheme membership and benefits are offered at the discretion of SSP and its subsidiaries and affiliates which are members of the SSP group collectively the "SSP Group". The Scheme is operated and administered by SSP. The Scheme is open to UK residents over the age of 16 only. 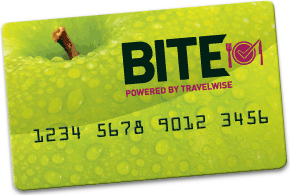 The BITE card can not be used in conjunction with any other promotion, voucher or discount unless otherwise explicitly stated. Agreement between User and Us This BITE Card website is comprised of various web pages operated by SSP. Only the individual that has registered for the BITE Card can use it. The BITE Card is issued by, and at all time remains the property of, SSP. The BITE Card is a loyalty card and is not and cannot be used as a credit card, charge card, debit card or identity card. We reserve the right at all times in our absolute discretion to refuse to register any individual for a BITE Card. SSP reserves the right to change the Terms, including (but not limited to) any charges associated with the use of the BITE Card. Upper Crust, Pumpkin Café Shop, Bonapartes, Caffé Ritazza, Camden food co. Delice de France, The Pasty Shop, Sloe Bar café, Burger King and Millie's Cookies. Alcohol is sold at participating outlets during licensing hours only to customers aged 18 years or over. The 10% (and/or any other notified) discount offer does not apply to the following product categories: confectionery, crisps, ice cream, newspapers, magazines, books, cigarettes, tobacco, telephone cards, The National Lottery and associated lottery products and such other product categories notified to BITE Card holders from time to time. Please note that Burger King in Marylebone station is not part of the Scheme so the BITE Card will not be accepted at this outlet. BITE Card offers are not available in any shopping centre outlet operated by Us and cannot be used in conjunction with any other offer. This BITE Card website may contain links to other websites ("Linked Sites"). The Linked Sites are not under the control of SSP and we are not responsible for the contents of any Linked Site, including (without limitation) any link contained in a Linked Site, or any changes or updates to a Linked Site. SSP is not responsible for webcasting or any other form of transmission received from any Linked Site. We provide these links to you only as a convenience, and the inclusion of any link does not imply endorsement by Us of the site or any association with its operators. The BITE Card is not to be resold. As a condition of your use of the BITE Card and/or this website, you agree that you will not use the BITE Card or this website for any purpose that is unlawful or prohibited by the Terms. You may not use the BITE Card or this website in any manner which could damage, disable, overburden, or impair the website or interfere with any other party's use and enjoyment of it. You may not obtain or attempt to obtain any materials or information through any means not intentionally made available or provided for through this website. The information, software, products and services included in or available through this website may include inaccuracies or typographical errors. Changes are periodically made to the information on the site. SSP may make improvements and/or changes to this website at any time. We make no representations about the suitability, reliability, availability, timeliness and accuracy of the information, products, services and related graphics contained on this website for any purpose. If you are dissatisfied with the BITE Card, this website or with any of the Terms, your sole and exclusive remedy is to discontinue using the BITE Card and this website. By registering to participate in the Scheme you will be asked to provide certain personal information, including your name, mobile phone number, email address and date of birth. We are committed to maintaining the security of your personal information in accordance with the requirements of the Data Protection Act 1998 (and any other applicable data protection laws) and will take all reasonable steps to ensure that your personal data is kept secure against unauthorised access, loss, disclosure or destruction. We may amend or waive any provision of the Terms at any time for any reason, including but not limited to; security, legal, regulatory and/or valid business reasons. Any variation will become effective at the time we post the revised Terms on our website. The use of the Scheme after such changes will be deemed acceptance of the modified Terms. We shall use reasonable endeavours to provide you with advance notice by email of any planned variation to the Terms, but if we are unable to do so for any reason the variation will remain effective from the time that the revised Terms are posted on our website. We reserve the right to suspend or terminate the Scheme at any time by providing you with reasonable notice. However, where we have reasonable grounds for considering immediate termination (including, but not limited to, fraudulent or unauthorised use of the BITE Card) we need not provide you with any notice of the termination. (b.) your BITE Card will always be accepted at a store participating in the Scheme. To the maximum extent permitted by law, under no circumstances shall SSP be liable for any direct, indirect, punitive, incidental, special or consequential damages, whether arising in contract or in tort, or any other damages whatsoever including without limitation damages to any mobile device or for loss of use, data, business or profits arising out of or in any way connected with the use or performance of the Scheme whether directly or indirectly. Notwithstanding any provision of the Terms, nothing in the Terms shall exclude or restrict either party's liability for fraud or death or personal injury resulting from its own negligence or any other liability which may not by law be excluded or restricted. The benefit of the Terms may be transferred to any other company in the same group of companies as SSP. Any complaints relating to the Terms, the Scheme or the BITE Card should be emailed here. You have the right to cancel your BITE Card at any time by contacting us here. The Terms shall be governed and construed in accordance with the laws of England and Wales and shall be subject to the exclusive jurisdiction of the courts of England. * Burger King and the Crescent logo are registered trademarks of Burger King Corporation.